Title: BBC Radiophonic Music This album was remastered by Mark Ayres and released on CD in 2002. The CD offered two new tracks, Happy Birthday and Time to Go, both by Delia Derbyshire. 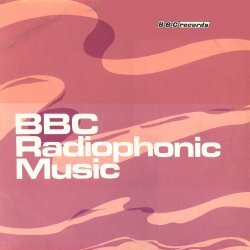 This record has been produced with the intention of entertaining rather than informing: the items chosen do not necessarily represent a survey of the music created at the BBC Radiophonic Workshop. Established in 1958 to provide original sound treatment for Third Programme drama, we now provide a creative service for Radio, Television, Local, Regional and External Broadcasting. The Unit produces an output varying from complete background scores of electronic music for radio and television drama through experimental poetry programmes to signature tunes. The Workshop at the BBC Music Studios in Maida Vale, London, is equipped with tape recording machines and other electronic equipment for generating and manipulating sound. The composition and realisation of this music and sound is done by a small number of specialised creative staff. - Desmond Briscoe, BBC Radiophonic Workshop. Born in Leigh-on-Sea in 1937. Studied composition and piano at the Royal Academy of Music. Joined the BBC in May 1960 as a sound mixer and transferred to the Radiophonic Workshop in April 1963. Most of his time he composes and puts together signature tunes for radio and television programmes. Although the music is conventional, some of the sound qualities are rather unusual. In "Sea Sports" and "Reading Your Letters" the basic sound is a cork being pulled from a bottle and bubbles escaping. For "New Worlds" the bass line is made from a metal spring being released and "Radio Nottingham" and "Factors" use the sound of blowing across the neck of a small bottle. "Structures" is compiled of music made for a television documentary about the life and work of Ove Arup. Only sounds from electronic oscillators were used here. "Tomorrow's World" is also electronic music. This was made for a short film of patterns traced on an oscilloscope by a computer. He is particularly interested in combining electronic music with live musicians, and has composed music for plays and documentaries using musicians from the jazz and pop world. Born in Stoke-on-Trent in 1941. Educated at Brewood Grammar School and Imperial College, London, where he gained a degree in Mathematics. Joined the BBC in September 1963 as a Studio Manager and specialised in radio drama. Following a short-term attachment to the Radiophonic Workshop he became a permanent member of the Unit in April 1967. An experimental radio production of Eliot's "The Wasteland" was undertaken in 1967 for the BBC Rothwell Group and a setting of a poem on the Mass for chorus. boys' choir, solo speaker and electronic tape, was performed at the Brighton Festival in 1968. He composed a full sound score for the radio production of "War of the Worlds", did some exploratory work in the use of concrete and electronic sounds as accompaniment to song and poetry in the television series "Six Bites of the Cherry": and composed music and special sound for the radio serialisation of Tolkien's "The Hobbit". He also did the sound, composition and orchestration for the Total Radio Stereophonic Experiment "RUS", a History of Russian Culture. His hobbies are singing medieval and baroque music and writing for a jazz orchestra. Born in Coventry in 1937; trained as a pianist; read mathematics and music at Cambridge University; has worked at the Radiophonic Workshop since 1962. Each programme to be worked on usually requires that the precise mood be established, and in achieving this the transient or incidental nature of the music has to be remembered. As a result she often decides to attach more importance to the musical quality of the individual sounds than to the musical argument, which is usually kept simple or even non-existent. She prefers to use an analytical approach and to synthesise complex sounds using electronic sources; she finds that this throws valuable light on the nature of sound and the way we hear and interpret it. Of the tracks chosen for this record, only "The Delian Mode" and perhaps "Blue Veils and Golden Sands" are representative of this way of working. More typical is her music for Barry Bermange's four "Inventions for Radio", broadcast on the Third Programme.